Until its absolute closing moments, Get Out presents the cause/effect of American racism in an acerbic manner, completely unlike anything in cinema prior. 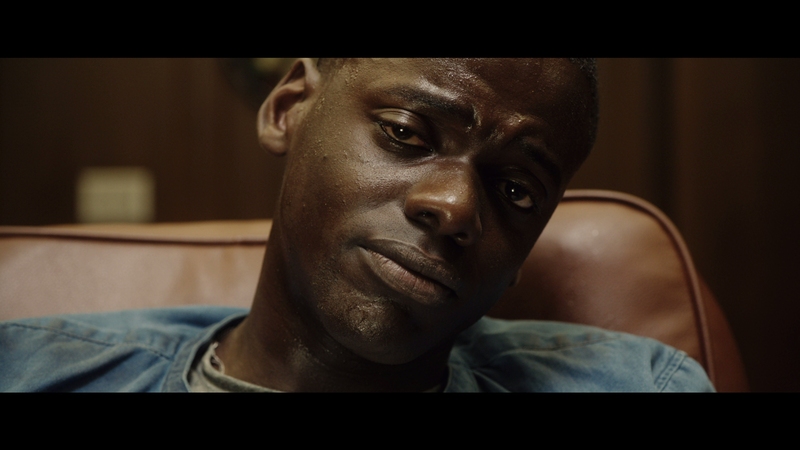 Get Out approaches the topic and circumstances with a wily, passive aggressive manner. Daniel Kaluuya, staring down a house overstuffed with privileged, upper class white people, just smiles. He nods. Inside, he’s dying a little every time they speak. Get Out hits with immediacy. 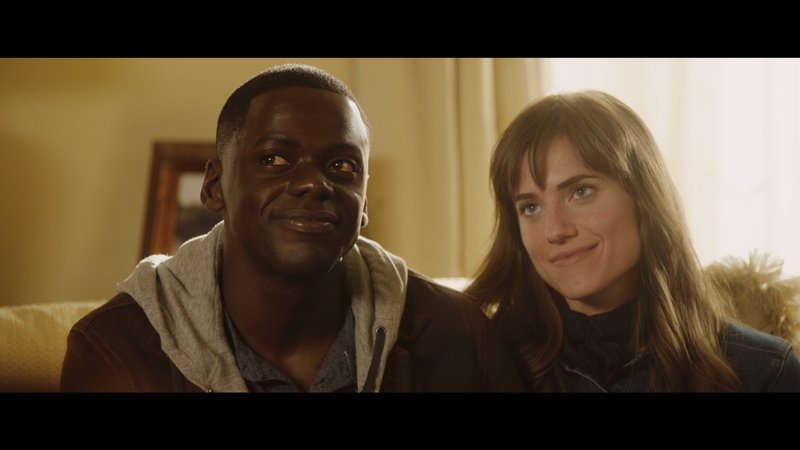 Kaluuya asks his white girlfriend Rose (Allison Williams) if her family knows he’s black, an underlying fear surfacing before their road trip to a weekend excursion. Despite a wayward fantasy quality to Get Out’s observant folktale-esque tone, underlying the developments is a scathing dark comedy, draped in social horror. And later, all-out horror. Kaluuya meets Rose’s parents, one a therapist, the other a neurosurgeon. They’re well off. Their considerable brick home exterior and fashionable interior room décor are maintained by servants – all of them black. Rose’s family speaks of Obama – awkwardly – and ask about race and culture as if they’re the only topics of potential conversation. Kaluuya smiles. It’s a fantastic, genial smile. He’s done this before, and not just on camera. If Get Out reflects an uncomfortable, gawky circumstance, good. The intent works. Later, there’s a party. More rich white people, condescendingly staring down Kaluuya as if an enigma. An Asian man with a heavy accent asks, “What is the African-American experience like in America?,” and asks the question with a peculiar, almost stubborn earnestness. More smiles. Despite the tinge of satire, writer/director Jordan Peele fills Get Out with personal flourishes. It’s absurdly funny, observational comedy much as it is depressingly real. From there, a descent into horror fantasy; mad scientists tropes and a kooky basement laboratory, classically aligned if terribly out of place. Kaluuya, a racial figment, starts drawing blood, partly out of defense, partly for the sake of an audience eager to see affluent people taken to the slaughter. 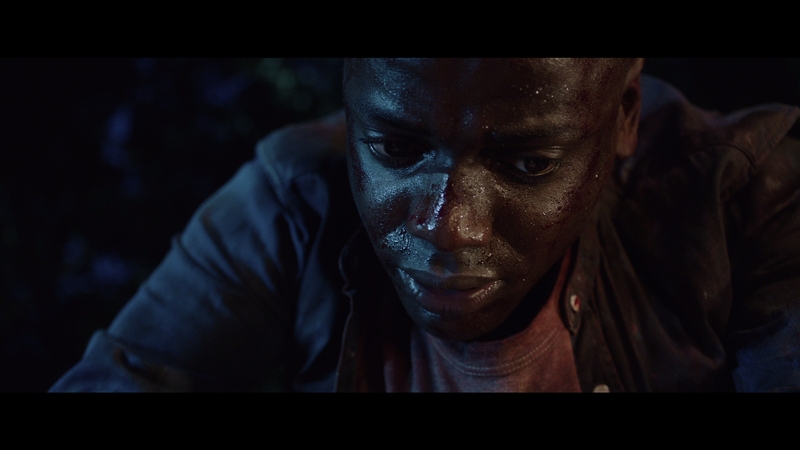 Get Out’s solution is predicated only on theatrical, fist-pumping violence. 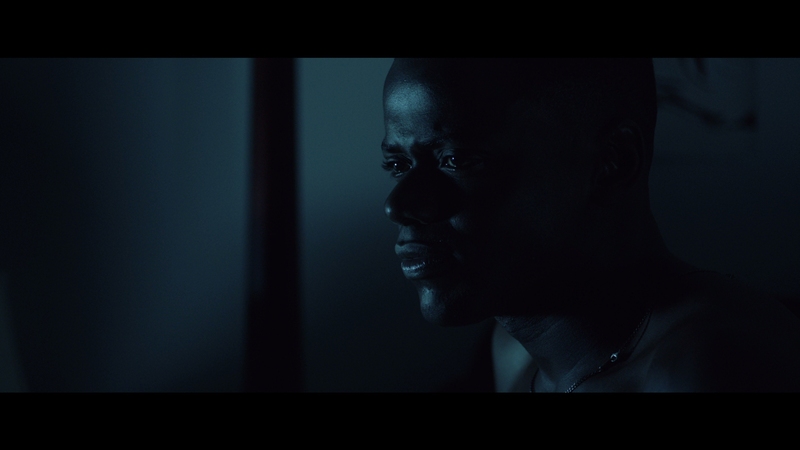 The effort taken to expose racial bias slinks into a derivative corner – Kaluuya’s tale swerves from trying to sort out how these people still function into a slasher story with a darkly comedic end. An alternate ending available on the Blu-ray finds a better out. It’s more somber, more real, and less in line with an audience gratifying, guilt-free outburst of murder. Those end results leave Get Out on a narrative whiff, counter-intuitive, even if acting on understandable raw frustration. 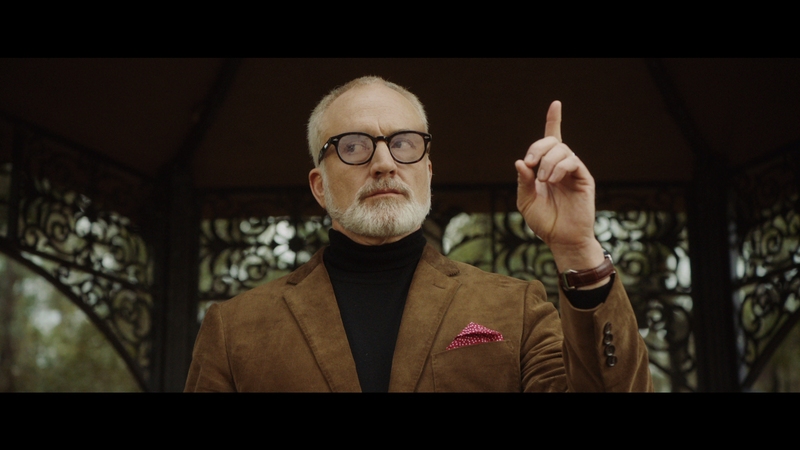 Get Out has a sly dialog. It just dies when it stops talking and smiling. 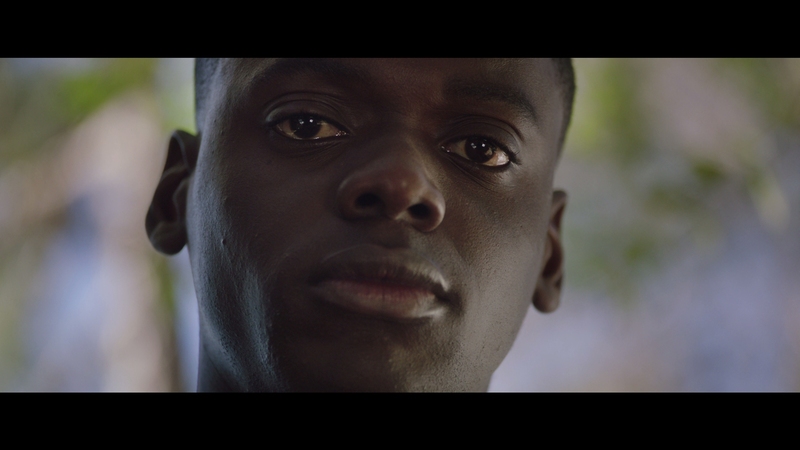 An absolute looker on Blu-ray, Get Out opens with awesome depth and resolution. Peering down a suburban street, trees lining the sidewalk and shadows all around, the opening scene showcases the format. Those trees resolve as far as the camera can see while black levels maintain image depth. Both of those features carry a consistency rare for modern digital cinematography and this format. Strong resolution brings in facial detail at rarely seen levels. A low-budget production means the camera often goes in close and stays there. Each new close-up seems to surpass the previous one. The level of fidelity on this disc is quite special. A little hint of chroma noise and one weird two second instance of banding mar Get Out to the slightest degree. Neither offer anything of worry. Dense, consistent shadows can hide a lot while giving the feature a depth near a new standard for Blu-ray. Excellent channel distinction opens Get Out. A dog barks on side of the soundstage, a car passes on the other. As the scene progresses, music from the car travels between channels. 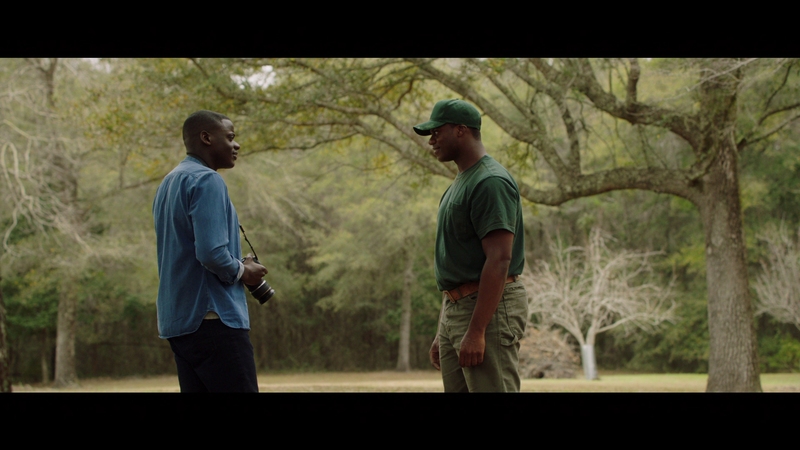 Get Out makes use of the DTS-HD track for strong ambiance, using the Alabama locations to pipe in birds or rain as needed. Short scenes at an airport nicely envelop the soundstage. 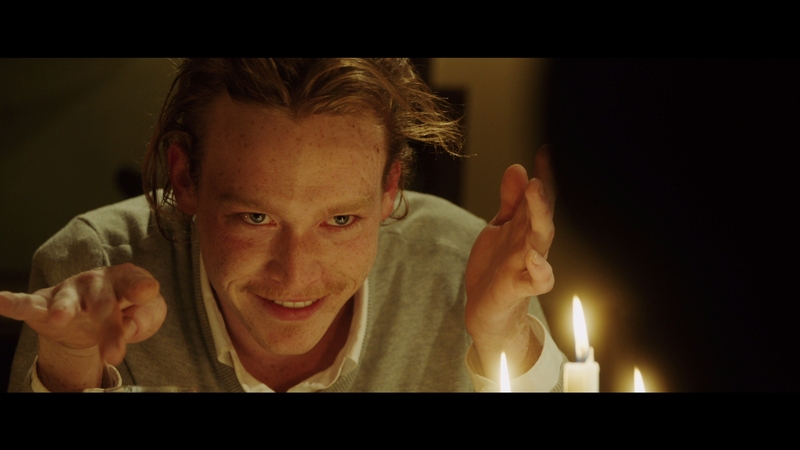 For the finale, gunshots stretch the dynamic range, which seemed asleep for most of the film. A music sting earlier shows off the sub, but the fired rounds offer additional might. Expect to find writer/director Jordan Peele all over these bonuses, beginning with his commentary. He continues to chat over 11 deleted scenes (23-minutes total) and the mistakenly deleted alternate ending. 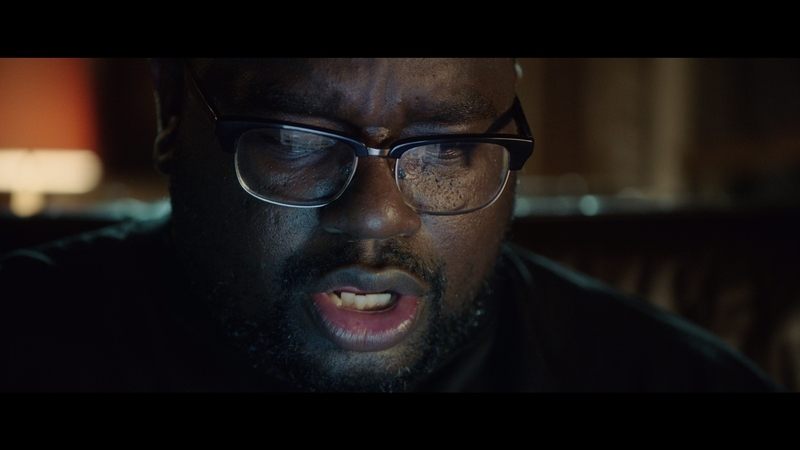 Unveiling the Horror of Get Out takes eight minutes of time, fairly typical for a studio featurette. It’s a shame the followup Q&A session is edited, taken from a Chicago screening. At five minutes, the conversation is too truncated. 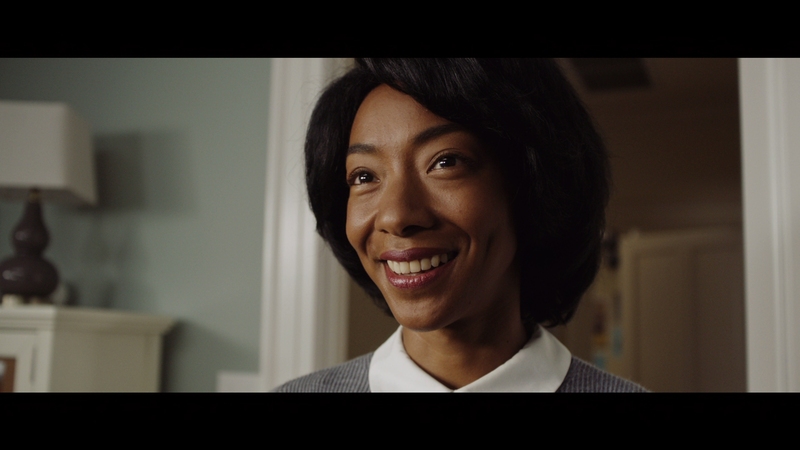 Jordan Peele writes/directs two sensational acts for Get Out, but closes on a clumsy finish that feels out of place and tone. Click on the images below for unaltered, full resolution screen captures taken directly from the Blu-ray. Patreon supporters see our screen shots first, view our entire library in .png format, and gain fast access to 12 Get Out exclusives for as little as $1, perfect for custom cover art, film study, or other applications.